POST a QUESTION or READ FAQs about how to find, identify, & use or troubleshoot each control or switch found on air conditioners or heat pumps. What is the proper location & permitted distance for a safety electrical disconnect switch at or near the outdoor compressor/condenser unit of HVAC systems? What is the requirement for placement, distance, and readily accessible nature of the disconnect or motor controller for equipment operated by an electric motor. U.S. NEC code citations, excerpts, discussion. This article series explains where to find and how to use the switches and controls for air conditioning and heat pump systems. We list and explain the function of each air conditioner or heat pump control or switch, including providing identification photographs and troubleshooting tips. The pair of photographs at page top and just above show the outdoor air conditioner or heat pump compressor/condenser service control switch, in this case a circuit breaker, installed outside at a compressor for a ductless cooling system compressor. More photographs of a ductless or split system air conditioning system are at A/C TYPES, ENERGY SOURCES. Below you will see an air conditioning system compressor/condenser service switch for an outdoor compressor/condenser outdoor unit that was remarkably unsafe. 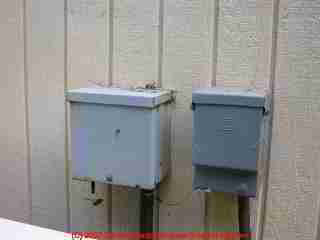 The photo (below) shows that there was a 240V fused circuit with outdoor fuses in the box, but this close up photograph [Image file] shows that someone has installed 1/2" copper pipes in place of the original fuses. This might be a dangerous installation, risking fire as well as a burn up of the air conditioning equipment. But as Mark Cramer [contact reference] pointed out, if the circuit were properly protected by breakers or fuses at the main panel, the insertion of metal pipes in these fuse sockets just converts the device from a fuse box to a simple switch. An on-off switch is all that is required for this location and application by electrical codes. Circuit breaker(s) at the electrical panel protect the circuit supplying power to the air conditioning system. Typically separate circuit breakers (or fuses) power the compressor/condenser unit and the indoor air handler/blower assembly. 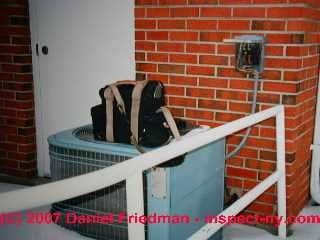 In any case, simply installing fuses would restore the proper safety device but it's likely that further testing and diagnosis of the electrical circuit and the compressor/condenser unit will be needed to determine why someone installed copper pipes where fuses belonged in the first place. When someone converts fuses to a switch in this location it may be because the air conditioning system was frequently blowing the fuses -- someone wanted to force the compressor/condenser to run. The air conditioning system compressor service switch is located outdoors, at the compressor/condenser unit, typically on a building wall near the outdoor unit, this switch may be a circuit breaker, a fuse block pull-out, or a simple electrical switch. Service switches permit a service technician to work safely on the equipment by turning off electrical power to the unit without having to run back and forth through the building to the main electrical panel. Where the compressor/condenser service switch is omitted some technicians are tempted to work on equipment while it is electrically "live", and a few of them get shocked. These switches are required by current electrical codes but may be absent on old A/C installations. If no service switch is installed at the compressor/condenser you should have one installed at the next A/C service call or next electrical work done on the building. In our photograph the A/C service switch is very unsafe for two reasons: first, because it is falling off of the wall it may be difficult to operate the switch. Second, ask yourself, "What happened to the screws that were used to fasten this switch to the building wall?" We've seen cases of the mounting screws falling into the switch box, causing a short circuit or even a fire. In this particular case the vinyl siding installers pulled the switch loose to install siding and didn't bother to reinstall it. The following details are excerpted from the 2011 edition of the US National Electrical Code / NEC. NEC 430.102(A) and (B) apply to electric motors driving other equipment such as a non-hermitcally-sealed compressor motor found on some commercial equipment or such as a fan coil unit. I [DF] have encountered these installations at both walk-in coolers and some commecial freezers. NEC 430 includes definitions of readily accessible and of within sight. The two sets of disconnect distance rules are similar. NEC 440.13 disconnect for room air conditioners or heat pumps - paraphrasing: the air conditioner or heat pump unit disconnect must be within sight from and readily accessible from the unit. 440.13 Cord-Connected Equipment. For cord-connected equipment such as room air conditioners, household refrigerators and freezers, drinking water coolers, and beverage dispensers, a separable connector or an attachment plug and receptacle shall be permitted to serve as the disconnecting means. Informational Note: For room air conditioners, see 440.63. For a room air conditioner such as a window-unit, an electrical cord plug that can be simply un-plugged from the electrical receptacle counts as an acceptable disconnect provided the cord is shorter than 6 ft. on a 220VAC unit or less than 10 ft. for a 120VAC unit. 440.14 Location. Disconnecting means shall be located within sight from and readily accessible from the air- conditioning or refrigerating equipment. The disconnect- ing means shall be permitted to be installed on or within the air-conditioning or refrigerating equipment. The disconnecting means shall not be located on panels that are designed to allow access to the air-conditioning or refrigeration equipment or to obscure the equipment name- plate(s). Exception No. 1: Where the disconnecting means provided in accordance with 430.102(A) is capable of being locked in the open position, and the refrigerating or air-conditioning equipment is essential to an industrial process in a facility with written safety procedures, and where the conditions of maintenance and supervision ensure that only qualified persons service the equipment, a disconnecting means within sight from the equipment shall not be required. The provision for locking or adding a lock to the disconnecting means shall be installed on or at the switch or circuit breaker and shall remain in place with or without the lock installed. Exception No. 2: Where an attachment plug and recep- tacle serve as the disconnecting means in accordance with 440.13, their location shall be accessible but shall not be required to be readily accessible. nformational Note No. 1 : See Parts VII and IX of Article 430 for additional requirements. Informational Note No. 2: See 110.26. Examples where this exception apply include room air conditioners, home refrigerators or freezers, similar free-standing plug-in cooling appliances. (2) an approved manually operable disconnecting means is installed in a readily ac- cessible location within sight from the room air conditioner. 440.64 Supply Cords. Where a flexible cord is used to sup- ply a room air conditioner, the length of such cord shall not exceed 3.0 m (10 ft) for a nominal, 120-volt rating or 1.8 m (6 ft) for a nominal, 208- or 240-volt rating. 440.65 Leakage-Current Detector-Interrupter (LCDI) and Arc-Fault Circuit Interrupter (AFCI). NEC 430.107 Readily accessible & within sight means that the disconnect switch is visible from the controlled-device and can be reached and used without having to climb obstacles or use a ladder. This distance is typically described as within 50 feet (3 meters), and in practice at most residential properties the disconnect is much closer (3-6 ft), on a wall or standard near the compressor/condenser unit. Within sight of is defined as within 50 feet (15 m) and able to be seen from the component being disconnected (and vice versa). The disconnect also has to be directly accessible, so "seen through a window or over a fence" would not be acceptable as it would not be safe. Typically there is also a GFCI protected outdoor electrical receptacle withgin 25 feet of the compressor/condenser, it's likely that those two features will be together at most installations. We have read reports that some local building code officials may require a closer distance - 3 feet - to the switch. Note that for the indoor equipment the rule is a bit different. NEC 440.14 permits the air handler disconnect to be on or even inside of a cover at the air handler unit, though in my OPINION on or adjacent-to the unit is safer as it doesn't require opening a panel into the air handler itself (where there could be moving parts or exposed wires) to access the service switch. NEC 430.102 disconnect for electric motors driving equipment or machinery provides minimum distance requirements for the disconnect for the electric motor or its controller. NEC 430.102(B) Motor electrical disconnect (paraphrasing) the electrical disconnect must be within sight of the motor (and driven machinery operated by the motor). This rule provides safety for workers on equipment that might be switched on or off without power passing through a separate motor controller device. Where both an electrical disconnect and a separate motor controller are both installed, at least one of these devices capable of turning off the motor itself (and thus turning off the machinery it drives) must be within sight from the motor and must be readily accessible. Where the electrical motor disconnect is within sight of and readily accessible to both the motor controller and the motor itself and the equipment driven by the motor then the electrical disconnect will satisfy both NEC 430(A) and NEC 430(B). Exceptions to these US NEC provisions are permitted where applying the provision is not feasible or not safe. Where there are multiple motor controllers installed, NEC 430.102(A) permits the use of a single electrical disconnect switch that turns off all of the "coordinated" motor controllers. 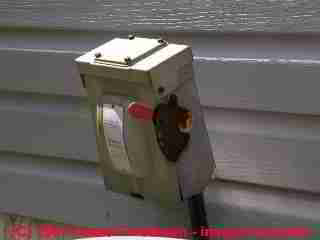 If you are referring to an indoor or outdoor electrical power switch, check with your local electrical supplier. If you are referring to the compartment cover or door of an air handler, possibly so, if you can read the manufacturer's name and box model number, just give the manufacturer a call. Other electrical switches and controls such as an air conditioner or heat pump pressure safety switch found on or near the compressor/condenser unit and in some window and through-wall units can also shut down an air conditioner or heat pump system, as we discuss below in this article. Air handler blower compartment safety switch: a safety interlock that will turn off electricity to the air handler or blower unit if the blower compartment door is not securely shut. If your air conditioner blower will not start this switch and the blower compartment doors should be checked. Air conditioner/heat pump contactor relay switch: turns on high amp drawing equipment such as the compressor motor. Air conditioner or heat pump pressure control & pressure safety switches: turns off the system at excessive refrigerant pressure and in some systems at too-low pressure. Also used in automotive air conditioning. Electrical panel circuit breakers or fuses will be provided separately to control the air handler (blower system) circuit and the compressor/condenser circuit. Of these the compressor is usually supplied by a 240V circuit and the air handler by a 120V circuit. Continue reading at CONTROLS & SWITCHES, A/C - HEAT PUMP or select a topic from closely-related articles below, or see our complete INDEX to RELATED ARTICLES. The main operating controls for HVAC systems and their functions are are discussed at OPERATING CONTROLS, A/C & HEAT PUMP where you will find a discussion of thermostats, zone dampers, and circuit breakers on air conditioners and heat pump systems. 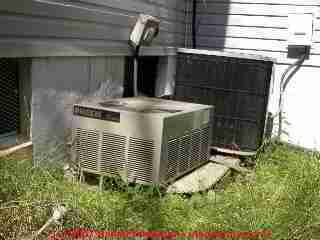 Other air conditioning and heat pump diagnostic procedures are at LOST COOLING CAPACITY. 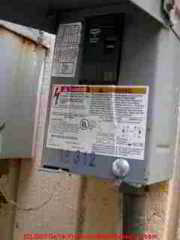 COMPRESSOR DISCONNECT SWITCH at InspectApedia.com - online encyclopedia of building & environmental inspection, testing, diagnosis, repair, & problem prevention advice.